For the last ten days, America has focused its attention on Table Rock Lake in southwest Missouri. The Duck Boat tragedy could easily have been prevented by heeding the severe thunderstorm warning that was issued 30-minutes before the sinking. Seventeen precious lives would have been saved. But, what if the warning system didn't exist or worked poorly? How many boats would sink each year? How many people would be killed by hurricanes and tornadoes? Seven years ago, again in southwest Missouri, the warning system failed to work as designed as a tornado approached the City of Joplin. The result was a catastrophic 161 deaths -- the worst single-tornado death toll since the civilian warning system began in the 1950's. ’Silent” is a must have for all people with even a tiny interest in severe weather. The author, Mike Smith, meteorologist and scientist investigates the catastrophic failure of the public weather warning system before and during the giant tornado that swept through Joplin, MO on May 22, 2011. Mike also includes riveting stories of those that survived and those that didn’t. His definitive examination of all the moving parts in the warning system is hard hitting and he spares no area deserving blame. This book is quite refreshing as it forces transparency to a life shattering event that many times would not easily be available to the public. With all of the high tech hardware and software developed in the years prior to the Joplin tornado, this system failure should not have happened. The author explains the the event and rupture of the safety net in a fashion where the reader feels like he or she was present in Joplin on the 22nd of May 2011, a very dark day indeed. And amazingly such a collapse in the warning system has already happened again. In 2018, an EF3 tornado hit Eureka, Kansas with no severe weather watch in effect and no tornado warning in effect. 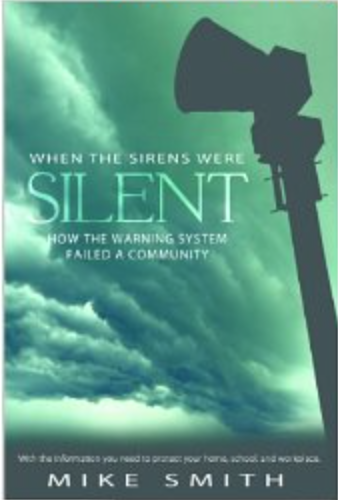 This book is very timely and it hosts the warning signals of a potential problem with our weather warning system. Gary England, July 16, 2018. Fabius Maximus Blog, December, 2017. Full review here. The book includes detailed tornado safety suggestions for work, for school and for home. While the warning system worked very well the evening of Thursday, July 19, prior to the Duck Boat tragedy, but it is been showing cracks recently. I'm compiling information on that topic and I'll be writing about that soon. In the meantime, if you would like to read the story of the Joplin tornado, here is a link to its Amazon site.